Finally. Finally! My closet is complete. I have been waiting very patiently for some time to free up so that we could work on the last essential closet element: the shoe rack. In our old house, right before we moved, A built me a super-fabulous shoe rack of a similar style. I loved it SO much, but didn’t really get to spend enough time with it before we moved. Then, in our temporary house, I was back to more of what I was used to in every other house I ever lived in, which is insufficient shelving leading down a dark road to a sad, messy shoe jumble. But now. Look at it! There are 10 tidy shelves that nearly reach the top of the closet. 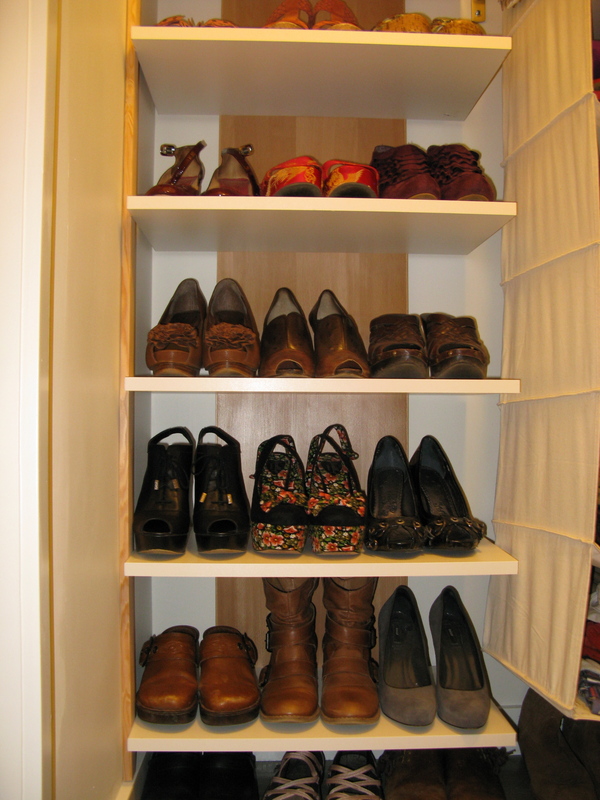 It brings overwhelming peace to my heart and mind to have all my shoes lined up in such a clean and organized fashion. I already know I am a little OCD, so you don’t have to whisper about it. Let me just also point out the beautiful design of this product, dreamed up by my fabulous husband. Sure, he could have sent me off to a large store that carries shelving and other organizational supplies and said,”Just get something,” but instead he planed wood and used biscuits and put a sweet little trim piece around the edge to create something not only extremely functional, but lovely to boot. I’ll just say this though. When we met, I was truly a clogs-only kind of gal. One day, A got me a gift of these sweet shiny red pumps. I would never in a million years at that point in my life have ever even considered adding something like that to my wardrobe. But there they were. They were comfy. They were so stylish! I was completely hooked! Not my fault! So now, I can say, without exaggeration, that I adore shoes. And even more, I love that I have a pretty place to put them. The truth is those red Kate Spade shoes unleashed an economy-boosting machine of the highest order. It’s quite a sight to see her new cabinet, filled with 33 pair of very cool shoes. Even better, it’s quite a sight to see K so excited. Good times!